Which is what people following the futures market action have been expecting for several months now. Speculators – usually wrong at big turning points and almost always at least slightly net long silver – have suddenly gone net short. 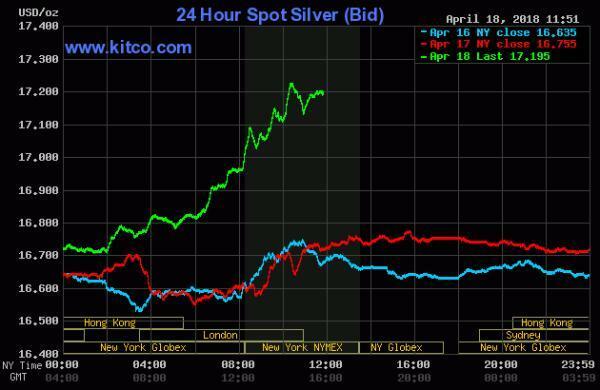 This is almost unprecedented, and implies that a short squeeze – in which speculators are forced to cover their short bets by buying silver futures, thus forcing the price sharply higher – is a real possibility. What does this mean going forward? Based on the extremes in the paper market the incipient short squeeze has a little longer to run. The next COT report comes out on Friday and will show where the speculators were on Tuesday. We can infer from today’s action that since Tuesday they will have closed a lot of shorts, which means we’ll have to wait for the following Friday’s report to know how many. Longer term, this is the kind of attention-getting action that puts an asset back on the radar screens of non-true-believers. As hard as it is for us gold-bugs to imagine, the vast majority of people aren’t watching precious metals and have no idea why silver matters. They do, however, notice when the price of something jumps. So if this short squeeze has legs and generates some headlines, it could pull in enough momentum chasing money to create a positive feedback loop in which rising prices beget more rising prices. People will then try to figure out why this is happening, which will expose silver’s extremely positive fundamentals – tiny available supply, falling mine production, rising demand from technology and other industrial uses, and a tendency to soar in times of monetary stress – thus expanding the pool of fundamental investors.